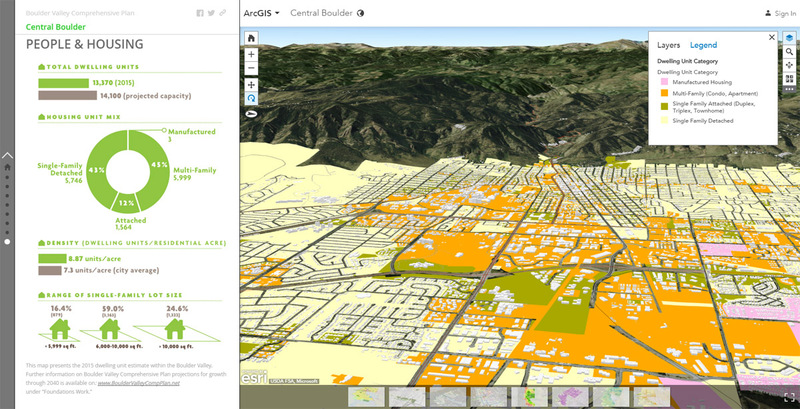 The City of Boulder and Boulder County are using Esri Story Maps and the 3D scene services with info graphics to explore new ways of communicating with the public at each stage of the Boulder Valley Comprehensive Plan update. Redlands, California—The American Planning Association (APA) has partnered with Esri to deliver new options for credentialed American Institute of Certified Planners (AICP) members to earn AICP Certification Maintenance (CM) credits. Under the new agreement, AICP-certified planners can earn CM credits by continuing their education in geographic information system (GIS) technology at Esri conferences, user group meetings, workshops, webinars, massive open online courses (MOOCs), and other activities. "Welcoming Esri as a Certification Maintenance provider is the next logical evolution of our ongoing partnership," said James M. Drinan, APA executive director. "Partnering with industry leaders like Esri helps our members stay current with the latest planning technology advancements that can enrich their work." The Certification Maintenance program helps planners gain the knowledge and skills they need to remain current in their practice. With the rapidly changing environment of big data, 3D visualization, and mobile applications, this new offering will support planners in their use of Esri geospatial technology, data, and analytics to streamline processes, engage with the public and planning commissions, and sustain current and long-range plans. "This new partnership answers the community's demand and will provide planners with the resources they need to make more data-driven and smart planning decisions," said Shannon McElvaney, community development manager at Esri. For more information on current Esri events and activities that meet eligibility for CM credits, visit esriurl.com/EsriCM.